Luckman Coffee is dedicated to "The Art of Roasted Coffee". Our beans are roasted in small batches and each varietal, estate and blend has it's own profile. My Goal is to "Romance" the optimum unique quality from each bean.We want to create a repeatable profile for every roast which will generate consistent quality in your cup! WHERE IS LUCKMAN COFFEE ? 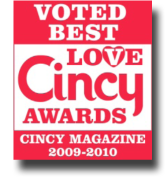 The Original Luckman Coffee opened Dec 14, 2006 at 5200 Beechmont Ave.
We have a Cincinnati address but the store is in Anderson Township at the Base of Mt. Washington and the End of the Beechmont Levee where Hwy 32 meets Hwy 125 (Beechmont Ave.). Luckman Coffee #2 opened February 11th at 8298 Clough Pike (at the corner of 8 Mile Rd. and Clough Pike) also in Anderson Township on Cincinnati's East Side.